When I posted about making Sloppy Joes for the first time last month, I mentioned my Chicken Lasagna and said I would post the recipe later that week. I never did, so I am posting it now. But I have another reason for posting it. A friend of mine commented on my blog’s Facebook page that she is not adventurous in the kitchen at all. She follows recipes to a “T” and does not experiment or try to create with what she has on hand. She doesn’t think she would be good at it and worries her family won’t like what she makes. Well, I want to address her and others out there with some “baby steps” to being more adventurous in the kitchen, and the lasagna I made last month is a great example. So here we go! 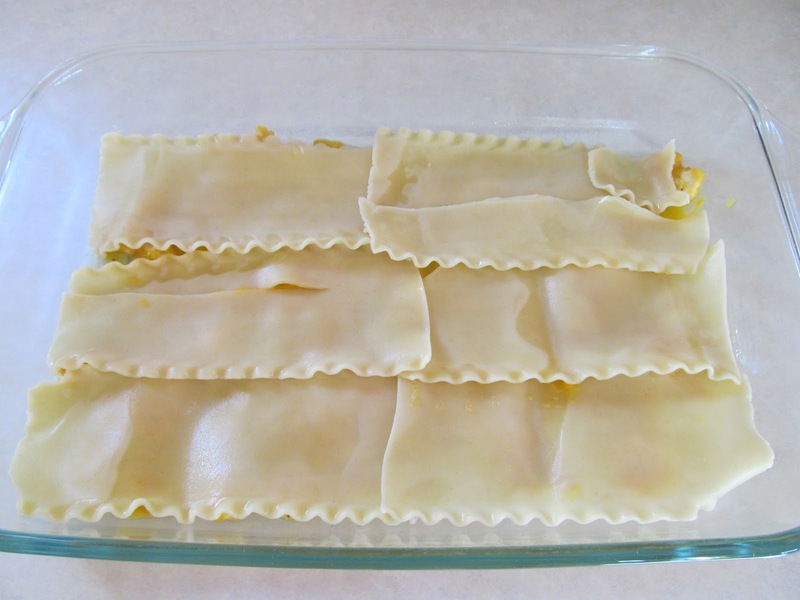 Cook lasagna noodles. Mix chicken, sour cream, creamed soup and dry dressing mix. In a 13″x9″ pan, put a small amount of sauce on bottom followed by a layer of noodles, a layer of sauce and a layer of shredded cheddar cheese. Repeat until you have 3 layers. Bake at 375 for 35-45 minutes. 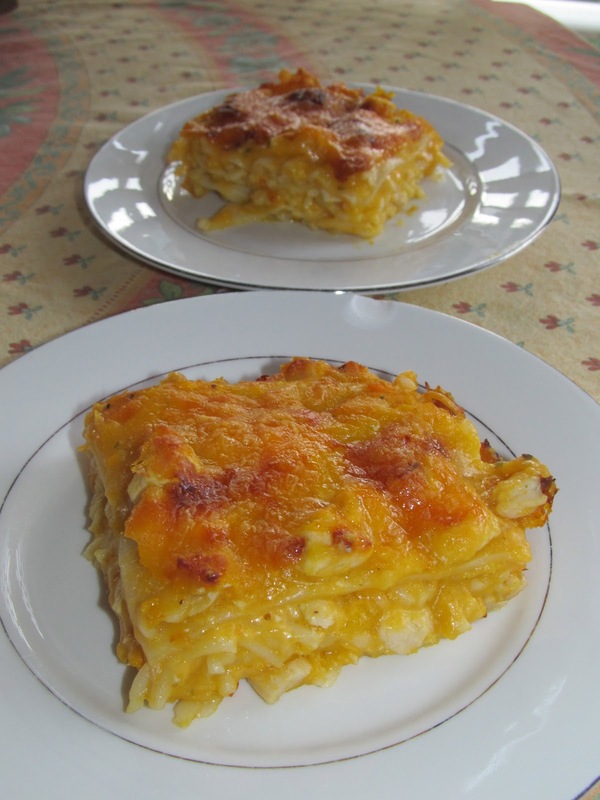 It’s very good and is a great dish to give someone for new baby in the house, recovering from injury, etc. But 4 years ago, I was inspired by Jessica Seinfeld’s Deceptively Delicious to reduce or eliminate the creamed soup, and I was successful. I substitute pureed vegetables for 1 or both cans of creamed soup. I’ve used yellow squash, carrots and pumpkin but the most popular, and the one I used most often, is butternut squash. I tried it with the canned stuff once, out of curiosity, and it was awful! Roasting and pureeing whatever vegetable you decide to use yourself is best. Here’s what I do. I wash the outside of a butternut squash, cut it in half and scoop out the seeds. Place the 2 halves, flesh side down, in my glass 13″x9″ pan and add 1/4″-1/2″ of water to pan. Roast in a 400 degree oven for 30-45 minutes (time depends on how small or how big your squash is). Remove from oven, place on a cool surface, face up, and let rest until cool enough for you to scoop out the flesh. Puree flesh with a little water in a blender, food processor or with an immersion blender until smooth. Adventurous alert: I also had a large sweet potato in the house that needed to be used up, so I roasted it in the oven with the squash, the same way – washed, cut in half, face down, cooled, pureed. I had never used sweet potatoes in my lasagna and decided to give it a try. Substitutions are a baby step in adventurous cooking. Before running to the store to get ingredients in a recipe, see if you can substitute with something else on hand! Butternut squash and sweet potatoes are both orange, they both are usually served roasted or baked and both can be pureed. While the squash and potato were roasting, I pulled out the rest of the ingredients. Only, I didn’t have the rest of the ingredients. I only had enough lasagna noodles for 2 layers, not 3, I had no sour cream and only 1/3 of a Good Seasoning Italian dressing packet in the house. What to do? Run to the store for the rest of the ingredients? No! Get adventurous! What can we substitute? Adventurous alert: I started searching for sour cream substitutes and all I had on hand in the creamy, dairy realm was mayo. Do I want to add 8 oz of mayo to my lasagna? Let’s keep looking. I already had more than enough pureed vegetables to replace the 2 cans of cream of chicken soup and the sour cream was probably added to the original recipe either to contribute creaminess or to use more brand name products. I looked around and had a can of cream of chicken soup, so I used half of it (5 oz) to replace the 8 oz of sour cream. A whole packet of Good Seasoning dressing mix is too strong for my taste, so the 1/3 packet I had was just fine. But I have also replaced it with a squirt or two of Italian dressing if I didn’t have any packets! Now, what to do for an extra layer of lasagna noodles that I didn’t have? Replace the middle layer with spaghetti! Step by step instructions of my Chicken and Butternut Squash Lasagna: I placed half a can of cream of chicken soup in a bowl and froze the rest for the next time. I filled the empty cream of chicken soup can twice – once with pureed butternut squash and once with pureed sweet potato. The remaining pureed veggies were frozen for other uses. To the cream of chicken soup and pureed veggies, I added my 1/3 packet of Good Seasonings Italian dressing packet and a squirt of Wegmans Low-Fat Parmesan Italian Dressing. Mix to combine. Spread a little of our mixture on the bottom of a 13″x9″ pan to avoid the noodles sticking to the bottom. Since I did not have enough lasagna noodles for all 3 layers, I used spaghetti for the middle layer. After adding sauce and cheese, you don’t even know what kind of noodle was used! Add a third layer of lasagna noodles, the rest of our creamed mixture and shredded cheddar cheese. Bake at 375 for 35 – 45 minutes and voila! I promise you will not be sorry you took the extra time to cook and puree your own vegetables and make this fabulous lasagna. It is so guest worthy! You can even make it, freeze it and pull it out later to thaw and bake. Please give it a try and let me know what you think. Thank you for this post!! It was just the inspiration I needed to use the butternut squash soup that my husband didn't care for as plain soup. He loved it as a pasta dish! I modified a little since I don't use canned foods or packaged seasonings and added fresh, chopped spinach to the layers. You're welcome! I'm glad you found a way to use that soup. I no longer use canned soup in this recipe. I use all butternut squash and herbs & spices from my cabinet as well. But I will definitely try spinach next time. Thanks for the idea! I'm glad you are enjoying my blog! Yes, I am on Twitter; you can follow me at https://twitter.com/YouMeAndB.